I wrote this post on Monte delle Vigne some nine years ago. On Friday I tasted Callas again. It had won a Tre Bicchieri award from Gambero Rosso and was on display at the event on March 1st. It’s always fun to try wines at a long interval of years and find that wines you wrote about years ago are still among your favorites. 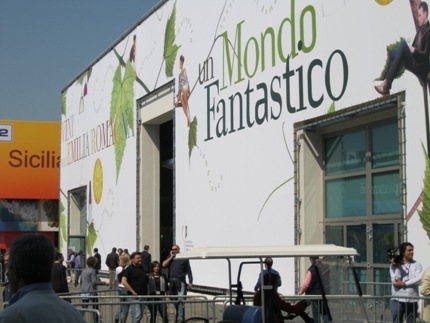 Thanks to some Italian contacts in New York, I was directed to the Emilia Romagna building at Vinitaly with a specific goal – to taste the wines of Monte delle Vigne, a winery located in Emilia Romagna near the city of Parma. Emilia has never been considered an optimum location for the production of still wines but has been largely well known for its Lambrusco of different denominations and coming from different indigenous clones. This Vinitaly I was interested in visiting some of the lesser known regions or at least those that I have less of an occasion to taste in the US. I remember quite well my days in Emilia. I lived in the lovely city of Bologna for a year when I was in graduate school at SAIS.